Pressure from Washington, of course. On the very day of Clinton’s speech in Paris the White House confirmed the completion of a $6.4 billion weapons transfer to Taiwan. If he were alive today he would be equally bemused by the U.S.’s top diplomat delivering an address at a military academy (and condescendingly admonishing the world’s most populous nation) and its defense chief pressuring the world to impose punitive sanctions against a country that has not attacked any other in centuries. The secretary general of the U.S.-led “world’s sole global military bloc” – Anders Fogh Rasmussen – spoke at the annual Munich Security Conference on February 7, delivering himself of a ponderous and grandiose screed entitled NATO in the 21st Century: Towards Global Connectivity, during which he touted the role of the military bloc in intruding itself into almost every interstice imaginable: The ever-expanding war in Afghanistan, terrorism, cyber attacks, energy cut-offs – the last two references to Russia if not formally acknowledged as such – nuclear non-proliferation, climate change, piracy, failed states, drugs, “humanitarian disasters, conflicts over arable land, and mounting competition for natural resources,”  North Korea and Iran. Indeed NATO has a broad and expanding network of members and military partners throughout the world. It has one member, Turkey, the second largest contributor of troops to the bloc, which borders Iran, and a partnership ally, Azerbaijan, which does also. The project received the name it did as it was inaugurated at the NATO summit in Istanbul which, after almost completing the absorption of all of Eastern Europe into the bloc, introduced the same graduated partnership process used earlier to incorporate ten new European members for the seven Mediterranean Dialogue nations in the Middle East and Africa (Algeria, Egypt, Israel, Jordan, Mauritania, Morocco and Tunisia) and six states in the Persian Gulf (Bahrain, Kuwait, Oman, Qatar, Saudi Arabia and the United Arab Emirates). All thirteen are covered under the ICI, but extending NATO military partnerships to six Persian Gulf nations for the first time was the most ambitious and significant aspect of the program. It marked the commencement of NATO’s drive into the Gulf to complement the U.S. strategy of containing and eventually confronting Iran. One of the stated objectives of the ICI was to “invite interested countries…to join Operation Active Endeavour (OAE),”  the NATO naval surveillance and interdiction operation (a de facto blockade) throughout the Mediterranean Sea which will be nine years old this October. The Istanbul Cooperation Initiative links control of the Mediterranean with expansion through the Red Sea to the Gulf of Aden, where the NATO Ocean Shield naval operation is currently being run, and the Arabian Sea into the Persian Gulf. -[I]ncorporating the Gulf states into a global missile surveillance and missile shield program. In 2006 NATO signed both military intelligence and transit agreements with Kuwait and initiated a new faculty for the Middle East at the NATO Defense College in Rome. NATO held a conference on the ICI in Kuwait in December attended by all six Gulf Cooperation Council states. The next year four of the six GCC members – Bahrain, Kuwait, Qatar and the United Arab Emirates – formally joined the Istanbul Cooperation Initiative. NATO’s penetration of the Gulf continued steadily and in May of 2009 Admiral Luciano Zappata of the Italian Navy and NATO’s Deputy Supreme Allied Commander Transformation (based in Norfolk, Virginia), while speaking of the new NATO Strategic Concept currently in progress, praised the Istanbul Cooperation Initiative as a “successful example” of the new model of “partnership and cooperation” the Alliance plans for most of the world. He said that “the network of ports, infrastructure and pipelines as well as vessels sailing along sea lines of communication supports trade and is vulnerable to disruption. The following month Sarkozy pushed a deal with the UAE for the purchase of 60 Rafale fighter jets at a cost of $8-11 million. In recent weeks the United States announced the sale of land-based interceptor missiles to Bahrain, Kuwait, Qatar and the United Arab Emirates. It has supplied both Patriot Advanced Capability-3 and Terminal High Altitude Area Defense (THAAD) missile systems to GCC states and has deployed sea-based Standard Missile-3 interceptors in the Gulf on Aegis class warships. GCC states being integrated into international NATO operations are being recruited for the war in Afghanistan. A U.S. armed forces publication disclosed in late January that 125 security personnel from Bahrain were guarding “the headquarters for U.S. military operations in volatile Helmand province, where more than 10,000 Marines are stationed and more are on the way.”  The U.S. and NATO are launching the biggest and bloodiest battle of the more than eight-year war in Afghanistan in Helmand. Troops from the UAE have been serving under NATO command in Afghanistan for years. In addition, Di Paola was quoted saying “The Alliance is close to closing the basic issue with one of the Gulf countries” and “We are looking forward to be in a position to follow on the temporary deployment that we have today in Oman with a more permanent long-term deployment.”  Oman directly overlooks Iran on the Strait of Hormuz. The true military powerhouse in the Gulf region, Saudi Arabia – armed to the teeth with advanced U.S. weapons – has been engaged in its first-ever war since last November. Riyadh has launched regular attacks with infantry, armor and warplanes in the north of neighboring Yemen against Houthi rebels. Hundreds of Yemeni civilians have been reported killed in the assaults, which rebel spokesmen claim have been accompanied by U.S. air strikes. 200,000 civilians have been uprooted and displaced by fighting in the north since 2004. The Saudi government acknowledges over 500 military casualties, both dead and wounded. The population of northern Yemen is Shia in terms of religious conviction, and the Saudi offensive is not only fraught with the danger of being converted into a war with Iran once removed but in fact can serve as a rehearsal – and training – for the genuine article. Last month NATO started recruiting ethnic Kurds for Iraq’s national security force in the north of the country near the Iranian border. Former NATO secretary general George Robertson, arguing that U.S. nuclear warheads should be kept in Germany, recently divulged that there are between 40 and 90 American nuclear weapons stored at Turkey’s Incirlik Air Base under NATO arrangements. The country has been granted a NATO Individual Partnership Action Plan as have other former Soviet states like Georgia, Ukraine and lately Moldova. In January Azerbaijan hosted a planning conference for the NATO Regional Response 2010 military exercise. Last year “the Regional Response 2009 military training was held within the NATO’s Partnership for Peace (PfP) programme in April 2009 in Baku. “The NATO Response Force (NRF) is a highly ready and technologically advanced force made up of land, air, sea and special forces components that the Alliance can deploy quickly wherever needed. To Iran’s east, the U.S. and NATO will soon have over 150,000 troops, and according to a recent study 400 bases, in Afghanistan and both Western belligerents are coordinating military actions with Pakistan, the Alliance through the Trilateral Afghanistan-Pakistan-NATO Military Commission. 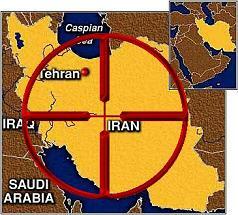 The chain is being tightened around Iran from every direction and NATO is forging several of the key links.